Several weeks have passed since the worldwide craze over “Love Yourself Seung Her,” the latest project from K-pop global stars BTS, reached its fever pitch. But the act is set to resonate the slogan “Love Yourself” all over the world once again, this time by embarking on a global anti-violence project in collaboration with the United Nations Children‘s Fund. 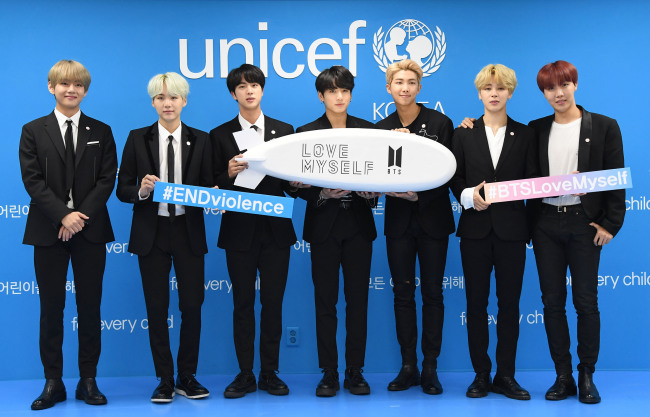 On Wednesday, the Korean Committee for UNICEF said that it will partner with the K-pop act to launch a global campaign dubbed “Love Myself,” a new initiative to call for an end to violence against children and teenagers. 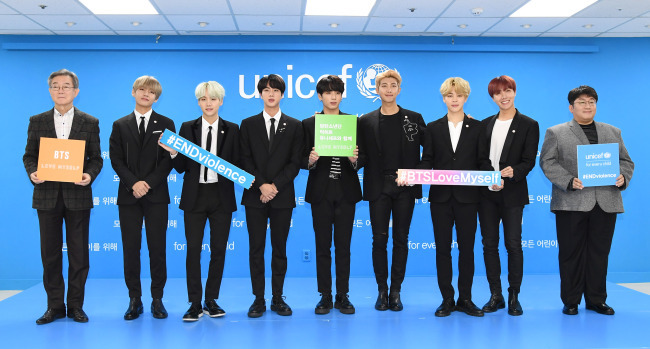 BTS and its agency Big Hit Entertainment will sponsor UNICEF’s #ENDviolence, an anti-violence campaign launched in 2013 to make the world a safer place for the young generation, over the next two years, according to the organization. The upcoming collaboration marks the first time for any local artist to participate in the organization’s global campaign. From Oct. 16 to 31, the seven-piece act amped up curiosity over its new project by flying blimps with the faces of each of the bandmates and the slogan “Love Myself” in the skies over Gwacheon, Gyeonggi Province, and Busan, in a prelude to the upcoming collaboration with UNICEF. “Since the group‘s debut in 2013, BTS has always sought to deliver social commentaries through its works, as we’ve been living in an era in need of recovery. Through our ‘Love Yourself Seung Her’ project, we’ve tried to convey that the true meaning of love comes from loving yourself. In the same context, the ‘Love Myself’ project is also poised to encourage the young generation to love themselves and gain self-confidence, which will be a way to love and embrace our society and nation as well,” said Bang Si-hyuk, head of Big Hit Entertainment, in a press conference and agreement ceremony for the new global project in Seoul on Wednesday. The event was attended by all seven members of BTS as well as Seo Dae-won, the secretary of the Korean Committee for UNICEF. “The campaign is not a one-time good deed. Just like the young generation finds joy from BTS’ content, BTS hopes to become leading artists in bettering our society and the world by expanding our positive influence beyond music. For the next two years, we will support UNICEF’s anti-violence campaign and pay keen attention to immediate global problems,” he added. As part of the collaboration, BTS and Big Hit Entertainment will donate 500 million won ($448,000) to the #ENDviolence campaign in November, and donate 3 percent of the “Love Yourself” series’ physical album sales income. They will also support the campaign by raising money with all the income from sales of official goods related to the campaign, as well as additional donations from the public. Official goods for the campaign will be out in December. “It’s not like seven of us will be able to change the world completely, but we at least hope to walk forward with our fellow generation in a more positive direction by reminding them of those two slogans (‘Love Myself’ and #ENDviolence),” said band leader Rap Monster at the Wednesday event. Jungkook shared that he was glad to participate in the campaign, as he had wished to join a UNICEF campaign in the past. “When flying out for overseas tour, I‘d often seen promotional videos for UNICEF on planes. Once I tried to participate in its campaign by signing an envelope. But I couldn’t, because a flight attendant didn’t give me one. I‘m glad that I can finally do it,” Jungkook said. Bang also emphasized how BTS has contemplated the means to communicate with society as artists. Bang said the band had expressed their wish to share its concerns with its own generation and make a better society through music during the group’s “Wings” tour earlier this year. Secretary Seo also expressed his support of BTS joining forces, highlighting that the brand of BTS, which is characterized by fighting off social ills and prejudices, falls in line with the United Nation’s Convention of the Rights of the Child, a value deeply rooted in UNICEF activities.